Absinthe is an emerald green liqueur flavoured with extracts of green anise, Florence fennel and wormwood - a combination sometimes known as the ‘holy trinity’. The medical use of wormwood dates back to antiquity and it is mentioned in the Ebers Papyrus, the oldest preserved medical document. The first evidence of absinthe in the modern sense of a distilled spirit dates to the 18th century. The exact origins of the drink are unknown. It is often held that Dr. Pierre Ordinaire, a French doctor living in Couvet, Switzerland, developed the recipe circa 1792. In 1797, the first absinthe distillery was opened by Henri Louis Pernod. 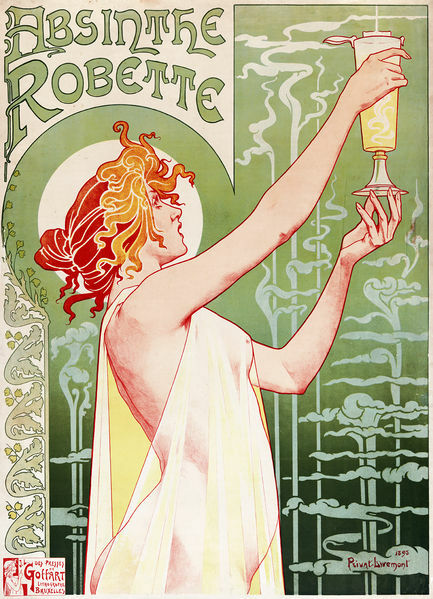 The drink went on to achieve great popularity in late 19th and early 20th-century France. It became so popular in bars, bistros, cafés, and cabarets that by the 1860s the hour of 5pm was called the green hour (l’heure verte). By 1910, the French were drinking 36million litres of absinthe per year. Celebrated drinkers of absinthe were Charles Baudelaire, Edouard Manet, Edgar Degas, Vincent Van Gogh, Oscar Wilde and Henri de Toulouse-Lautrec. Owing in part to this association with bohemian culture, consumption of absinthe was opposed by social conservatives and prohibitionists. Absinthe was portrayed as a dangerously addictive psychoactive drug. It was blamed for a variety of diseases and a syndrome – ‘absinthism’ – was identified. After consuming absinthe, at first the user would have a feeling of well-being but later hallucinations would arise followed by a depressive phase. Prolonged drinking of absinthe caused convulsions, blindness, hallucinations, and mental deterioration. In the syndrome’s advanced state signs of degeneration could be observed which could cause convulsions resulting in death. The chemical thujone, present in small quantities and deriving from wormwood oil, was blamed for these alleged harmful and hallucinogenic effects. This was based on observations such as those published by Jacques Joseph Valentin Magnan (1835-1916). Magnan exposed various mammals to the vapours of either wormwood oil or alcohol. He reported in 1874 that the animals inhaling the alcohol vapours got drunk, whilst those that inhaled the vapours of wormwood had a heightened risk of epileptic seizures. By 1915, absinthe had been banned in the United States and in most European countries including France, The Netherlands, Belgium, Switzerland and the Austro-Hungarian Empire. This ban remained largely in place for most of the last century. However many of bans have recently been lifted without any noticeable effects on public health. Absinthe was never banned in the UK and consumption here has always been comparatively low. The evidence for the true existence of absinthism now looks shaky. It has been suggested that the absolute amounts of thujone in absinthe are so small that its effects are overshadowed by those of ethanol and that it is not possible to distinguish the symptoms of absinthism from those of chronic alcohol abuse. By this reading the hallucinations attributed to absinthism are more properly attributed to either alcoholic hallucinosis or alcohol withdrawal delirium. A further possibility is that the effects reported in the 19th century are not connected with alcohol or to thujone but to the inexpensive toxins, such as copper sulphate, present in cheap absinthe imitations which aimed to mimic the real drink’s characteristic green colour. Sometime in mid-July 1518 a woman stepped into one of Strasbourg’s streets and began dancing. Within a week another thirty four had joined her. By end of August, it is said that 400 people had experienced the madness, dancing uncontrollably around the city. Local physicians were consulted. They excluded astrological and supernatural causes, declaring it to be a ‘natural disease’ caused by ‘hot blood’; treatment: more dancing. In an echo of the raves that would prove so popular five hundred years later, two guildhalls and an outdoor grain market were cleared so the afflicted could dance freely and uninterrupted. Musicians were provided. When dancers began to die the governors rethought their strategy. A new diagnosis was made; the dancing was now attributed to a curse sent down by an angry saint. In contrition gambling, gaming and prostitution were banned and the dissolute banished. When this proved ineffective the dancers were despatched to a mountaintop shrine and divine intervention was requested. In the following weeks the epidemic finally abated. 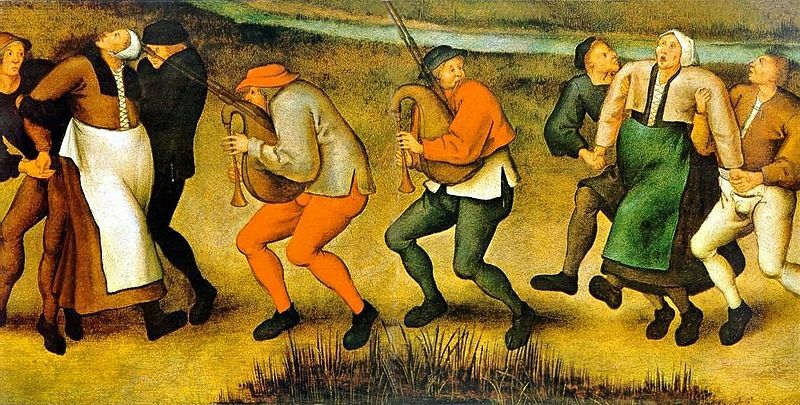 The first major outbreak of dancing mania is thought to have taken place in Aachen, Germany on June 24 1374 after which it spread quickly through France, Italy, Belgium, Luxemburg and the Netherlands. Outbreaks virtually always struck close to earlier similarly effected sites. Maastricht, Trier, Zurich and Strasbourg each experienced two or more episodes. Thousands of people danced in agony for days or weeks, screaming of terrible visions and imploring religious leaders to save their souls. It seems unbelievable today, but there is no question that these epidemics did occur. Dozens of reliable chronicles from several towns and cities describe the events of 1374. No consensus exists as to the condition’s aetiology. One theory is that sufferers had ingested ergot, a mould that grows on stalks of ripening rye and can cause hallucinations, spasms, and tremors. Epidemics of ergotism are known to have occurred in mediaeval Europe when people ate contaminated flour. But it is unlikely that those poisoned by ergot could have danced for days at a time and nor would so many people have reacted to its psychotropic chemicals in the same way. Others suggest that the dance was staged and part of a ritual of a banned sect, whose worship could take place under the guise of uncontrolled dancing. This explanation is questioned by those who believe that there is no evidence that the dancers wanted to dance, citing contemporaneous evidence that the dancers showed expressions of fear and desperation. A convincing explanation comes from the historian John Waller who posits psychological distress as a predisposing factor, cultural contagion as a trigger and pious fear as a perpetuating factor. He considers that sufferers were predisposed to the trance like states by high levels of psychological stress commonplace due to the travails of the Middle Ages. The 1374 dancing plague, for instance, spread in the areas most savagely hit earlier in the year by the most devastating flood of the 14th century. This in itself is not sufficient to explain why so many danced to their deaths. Here cultural conditioning is important: anthropological field studies and accounts of possession rituals show that people are more likely to enter a trance state if they expect it to happen and that entranced participants behave in a ritualistic manner shaped by the spiritual beliefs. In the times of the dancing mania there were common beliefs about wrathful spirits able to inflict a dancing curse. In this milieu once one particularly disturbed person started to dance others were likely to join. The prolonged course of the epidemics were also shaped by prevailing belief. Alongside those who may have been truly entranced, numbers were swelled by many people who took part due to fear, or just to be like other people. Dancing was thought to be both the affliction and its cure, although this now seems almost certain to escalate rather than ameliorate. This central role of belief is also apparent in the speed with which epidemics abated once victims had prayed at appropriate shrines or had undergone elaborate exorcism rituals. Finally further evidence for supernatural belief’s central role is that the demise of dancing mania by the mid-1600 coincides with its fall from influence. Dancing mania was confined to a specific period, but some have identified modern-day activities that display some of its characteristics. Raving features characteristics of dancing mania. For example, raves may involve activities that onlookers consider odd (such as partying all night), the use of drugs to bring on hallucinations, and participants who are part of a subculture. If we do accept the psychological distress explanation, then viewed from this distance perhaps dancing mania’s main message to us now is that symptoms of psychological distress and mental illness may not be fixed but can heavily influenced by the cultural environment and prevailing belief structures.